A drop-in program begun in 2006 which offers social and recreational opportunities for individuals with Acquired Brain Injury to socialize, learn new skills, and participate as they desire. This program runs Monday to Thursday from 9:30 a.m. to 3:00 p.m. and Friday from 9:30 a.m. to 2:00 p.m. The program is constantly changing based on participant input. This program runs out of our office at 850 King Street West, Unit 24, Oshawa, Ontario. A tour can be arranged ahead or facilitated if you drop by the office. 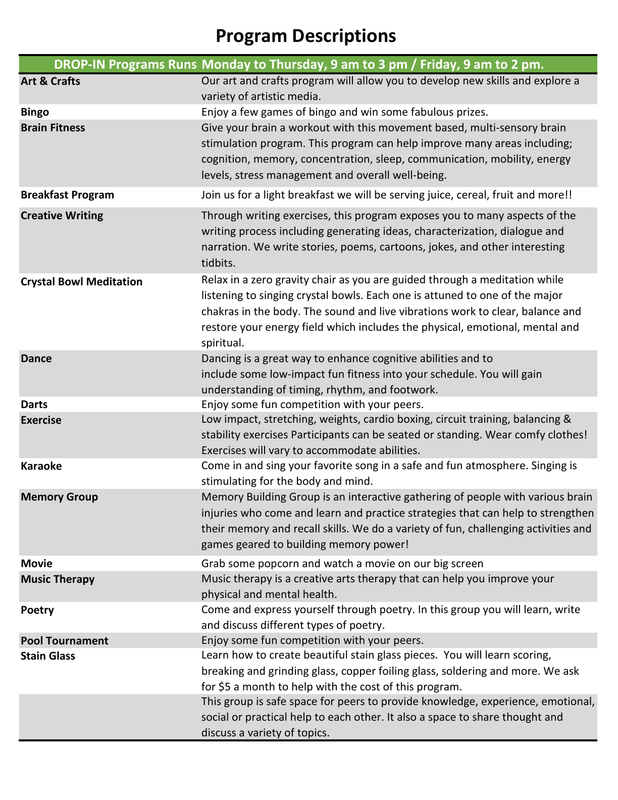 To see our current schedule please CLICK HERE Some of the programs we currently offer include.